If the Midshipmen only had to worry about Houston’s explosive offense, that would be quite enough. Oliver, however, makes winning on Saturday an even tougher proposition. Oliver tied an American Athletic Conference single-game record last week against East Carolina with five tackles for loss, including two sacks, in a 42-20 rout that propelled Cougars (5-1, 2-0) into sole possession of first place in the West Division. Navy (2-4, 1-2) already knew all about the 6-foot-3, 292-pound Oliver. 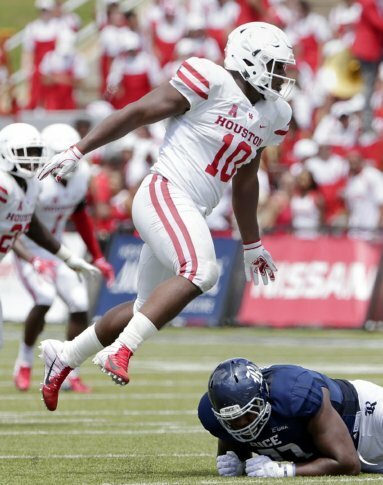 In Houston’s 24-14 victory over the Midshipmen last year, Oliver had 14 tackles (nine solo) and two sacks. As a freshman, the Houston native made 11 tackles, nine of them solo. Navy coach Ken Niumatalolo said Oliver is one of two defensive linemen for which his coaching staff has needed to prepare a special game plan. Aaron Donald, the 2013 Outland Trophy winner at the University of Pittsburgh, was the other. Donald is a four-time Pro Bowl selection with the Los Angeles Rams and was named 2017 NFL Defensive Player of the Year by The Associated Press. Oliver, a junior, is “dynamic and disruptive,” according to Niumatalolo. The 2017 Outland Trophy winner, who will no doubt turn professional after this year, has amassed 184 career tackles — 50 of them for a loss. Niumatalolo faces uncertainty at quarterback. Senior Garret Lewis made his second career start last Saturday and performed adequately during a 24-17 loss to Temple. Lewis rushed for 58 yards and a touchdown while directing three scoring drives. Malcolm Perry was the team’s starting quarterback through five games, but was moved to slotback against Temple. Niumatalolo said afterward that decision had more to do with how thin the Midshipmen were at slotback because of injuries. Senior Zach Abey, who started nine games at quarterback in 2017 and posted the second-highest single-season rushing total in program history, is also in the discussion to start Saturday. Quarterback D’Eriq King is the trigger man of a Houston offense that ranks fourth nationally with an average of 552.8 yards. The Cougars are third in the country in scoring offense at 48.7 points per game. Houston has displayed superb balance and is the only team in the Football Bowl Subdivision to rank in the top 16 in both passing offense (No. 16, 306 yards) and rushing offense (No. 16, 246.8). Navy ranks 100th out of 129 Football Bowl Subdivision schools and 11th out of 12 teams in the AAC in total offense with an average of 365 yards per game. Applewhite said a major focus during practice this week was eliminating penalties. Against East Carolina, the Cougars were whistled for 12 infractions for 115 yards, both season highs. “It was frustrating. It just seemed like we couldn’t get out of our own way,” Applewhite said. Houston had five holding calls, including one on defense that wiped out an interception. There were also three false starts, two pass interferences, an illegal man downfield and a personal foul for targeting that led to the ejection of safety Gleson Sprewell.